← How to print docx to tif? How to convert files of AutoCAD to psd? You may have used Photoshop before when you may notice that there is a file format called PSD which is short for Photoshop document. In fact, PSD is an image file created by Adobe Photoshop. It is a professional image format which can edit program. It may include image layers, adjustment layers, layer masks, annotation notes, file information, keywords, and other Photoshop-specific elements.PSD support RGB, CMYK, grayscale, monochrome, duotone, indexed color, Lab color, and multichannel color modes. If you want to convert files of AutoCAD to psd, docPrint Document Converter Professional will be a good assistant, which is consisted of three applications—GUI application, command line application and virtual printer application(docPrint to be introduced in this article and docPrint PDF driver) .You can call docPrint Document Converter Professional as docPrint Pro. docPrint Pro is a software product that dynamically converts MS Office 97/2000/XP/2003/2007, WordPerfect, AutoCAD DWG, PostScript, Adobe Acrobat PDF and many other document types to Adobe Acrobat PDF, PostScript, EPS, XPS, PCL, JPEG, TIFF, PNG, PCX, EMF, WMF, GIF, TGA, PIC, PCD and BMP etc formats. With docPrint Document Converter Professional you can convert your documents from and to 50+ formats easily. You can download docPrint Pro at http://www.verypdf.com/artprint/docprint_pro_setup.exe and install according to the prompts in installation wizard. In the end of the installation, you can choose whether to set docPrint as your default printer. If you convert files to files often in your work, you can click “Yes” because docPrint plays a role of document converter even though it is a virtual printer. The following contents are the details to convert AutoCAD to psd format file. 1.Please run the printer driver first after opening the dwg document. You can click “File” and click “Plot” in the dropdown list to open a dialog box titled “Plot-Model” and please choose printer as “docPrint” in “Name” combo box of “Printer/Ploter” group box. Then click “OK” button. You can also use the hot key “Ctrl”+ “P” to open the same dialog box. But if you have set docPrint as your default printer, there is no need to open dwg document and “Plot-Model” dialog box. 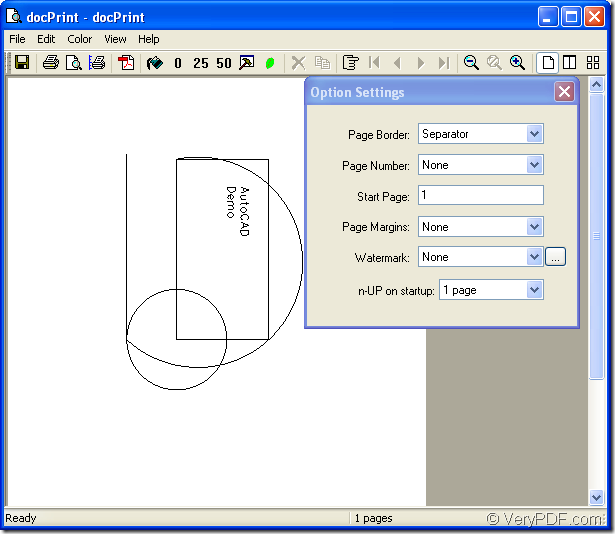 You just need to right click dwg file and choose “Print” option to run docPrint. 2. In popup “docPrint” dialog box showed in Figure1, you should focus on the methods to open “Save As” dialog box. You can click “File” and click “Save as” in dropdown list or you can click the icon to save files. The hot key “Ctrl”+ “S” can also work. 3. After doing the operations in step2, you can see the dialog box named “Save As” comes out, in which you can change some settings to the output file and run the conversion. Please see Figure2. 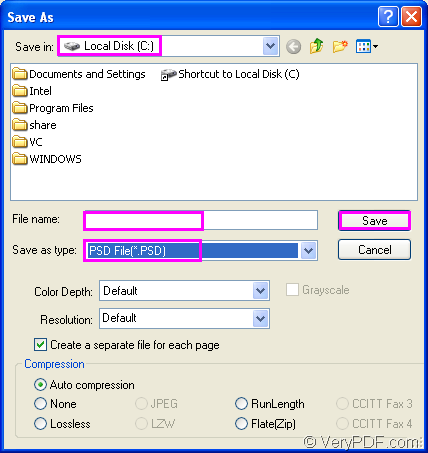 Please specify the directory for the output file in “Save in” combo box, input the name for the output file in “File name” edit box, choose the file type for the output file in “Save as type” combo box and save all the changes by clicking “Save” button. 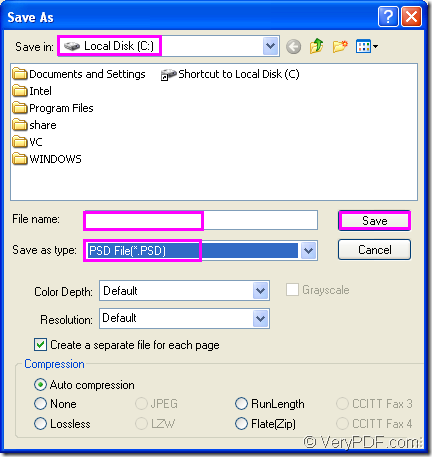 The file type here can be chosen as “PSD File(*.PSD)” if you want to convert AutoCAD to psd. Then the conversion will run itself and what you need is waiting for a short while. It will cost you only several seconds. Then you can find your target file in the specified location. The conversion of dwg to psd is also the same way, you can download docPrint Pro and try it yourself. How to convert documents of Microsoft Office Word to PCL? How do you run a command line application? How to convert mhtml to tiff? How to convert MS Office Excel to ps using Document Converter? How to convert documents of Microsoft Office Word to psd?